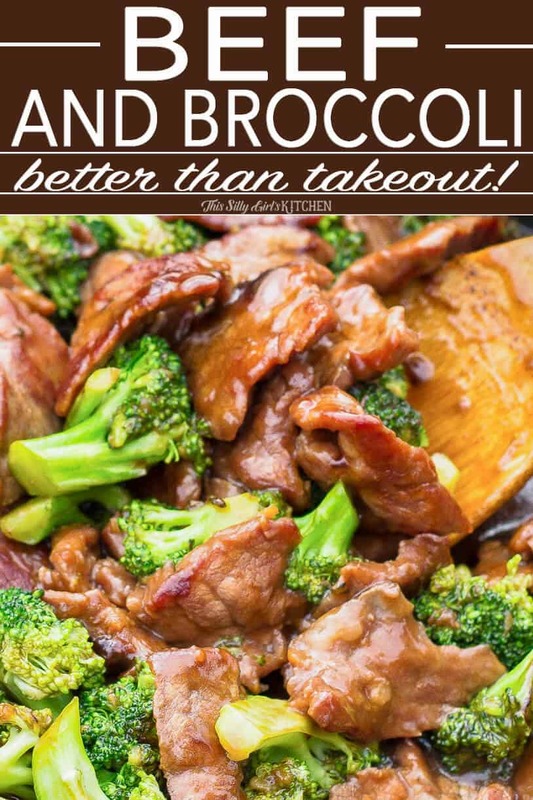 Beef and Broccoli - Easy and Better Than Takeout! Beef and Broccoli - Easy and Better Than Takeout! 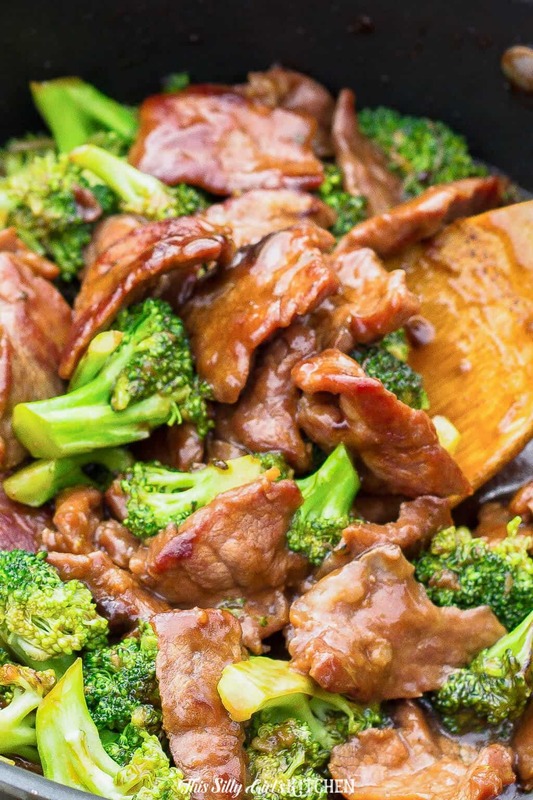 Beef and Broccoli, tender flank steak marinated and seared at a high temp, mixed with broccoli in a thick soy-based gravy, like your favorite takeout, but better! This beef and broccoli recipe uses simple pantry ingredients and is super easy to throw together. 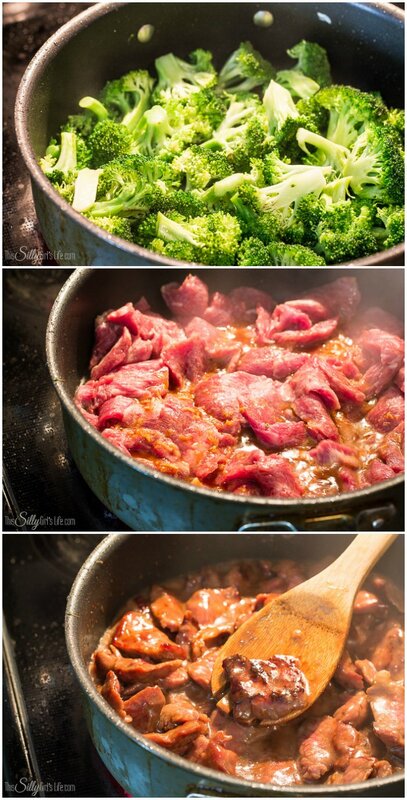 Beef and Broccoli… this recipe is truly better than any takeout restaurant I have had! I’ve put a lot of thought into this over the years and I think I have finally come to the conclusion that Asian food is my favorite. All of it. 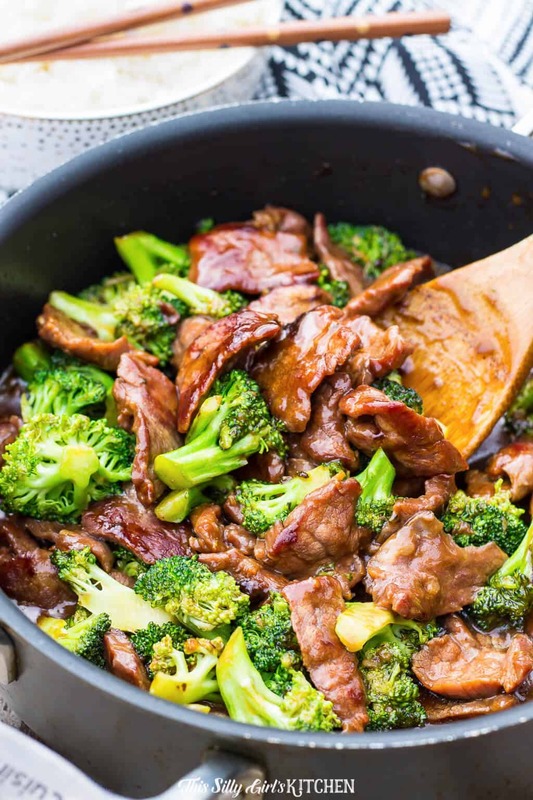 If you would rather not hear my super helpful tips and tricks, FAQ, and my overall awesomeness and get straight to this delicious Beef and Broccoli recipe – you can very easily scroll all the way to the bottom of this post for the full printable FREE recipe! Bon appetit. I’ve had versions of this dish that isn’t the best, you have to go to a more expensive restaurant to get the good stuff. Not anymore! And, believe me, this is an extremely easy recipe! Adapted from Rainy Day Gal. First, marinate the meat for at least one hour. 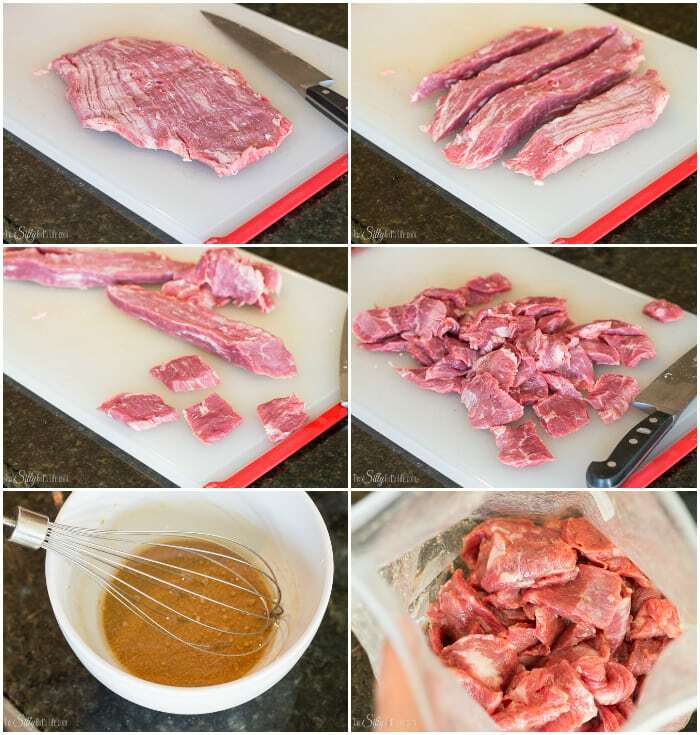 Once you are ready to cook this after the meat has marinated, it is a very fast process. Make sure you read all the directions first, have everything and won’t be interrupted. It is cooked over extremely high heat so you can’t walk away from it. Sear broccoli over high heat set aside. Add beef to the skillet, and sear until you form a crust on all sides. About 8-10 minutes. Add broccoli back to the pan and the gravy, toss to coat and cook an additional minute. Serve and enjoy! What is beef and broccoli? 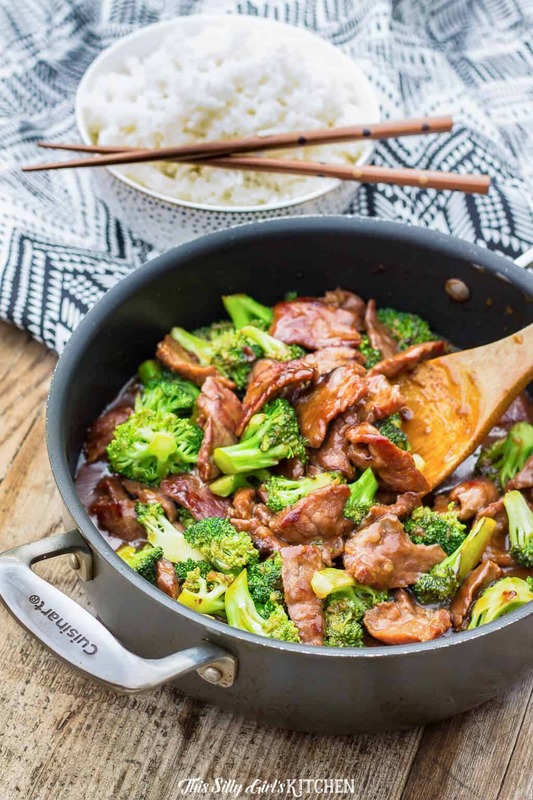 Beef and broccoli is a staple Americanized Chinese dish. With seared beef and broccoli at a high temperature, this dish goes together very quickly, making it an ideal weeknight meal. 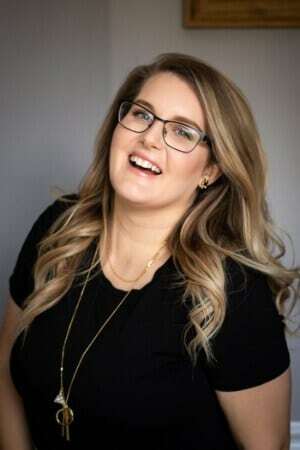 What’s in beef and broccoli sauce? 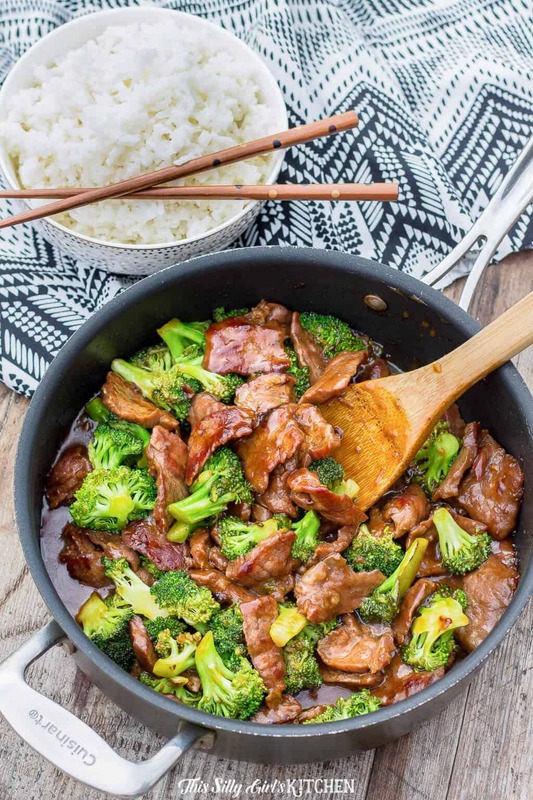 The beef and broccoli and tossed in a thick soy gravy made with soy sauce, beef stock, garlic, and ginger. This dish is extremely flavorful, and addictive. Yum, really try and get a good sear like the picture above. It makes all the difference, so good! I have made this multiple times already after finding the original recipe on pinterest, it is sooo good!! What beef for beef and broccoli? I love using flank steak because you can sear it super quick and it won’t overcook, leaving the beef very tender. If you can’t find flank steak, I have used a London broil I found on sale and it was just as yummy! You will love this beef and broccoli easy recipe! I really hope you liked today’s recipe, please try it… you will NOT be disappointed! What to serve with beef and broccoli? 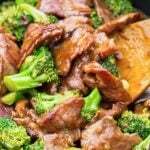 I love to serve this asian beef and broccoli with just plain steamed white rice. 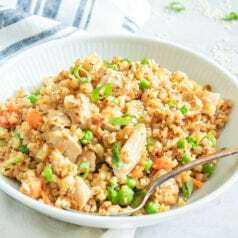 How to make white rice? In a small saucepot over medium-high heat, add 2 cups of water. Bring to a boil. Add one cup of long-grain white rice, stir a couple of times around the pot. Cover, reduce heat to low. DO NOT remove the lid, cook on low for 20 minutes. Take off the heat, let sit 5 minutes. Fluff with a fork to serve. I love to add 2 tablespoons of butter, 1/2 teaspoon of kosher salt, and a few cracks of fresh black pepper to mine. Stir to combine. This is totally my kind of dinner! Thanks for linking up with What’s Cookin’ Wednesday! I’ve made this twice now! It’s SO good! Made it with steak the 1st time and altered it tonight with chicken breast and chicken broth (in place of beef stock). Both ways are fantastic! Love Chinese food and I love being able to make it at home and know how many calories we are ingesting. I could seriously lick the pan with that sauce. So so good! YAY! So glad you love this recipe, thanks for letting us know! Wow! Made this tonight for dinner, it was amazing. I usually buy regular soy sauce, but so glad this recipe called for low sodium. It was perfect, the sauce thickened beautifully and this dish tasted so great over rice. Looked pretty too! This recipe is a keeper! 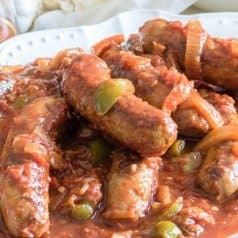 Oh my..this is the best…our family just loves it…I have made it at least 10 times and guess what?..we are having it again…thank you so much for sharing this awesome recipe! That’s amazing! Thanks so much for letting me know! Can you use stew meat for this recipe? Normally stew meat is very tough and needs to be cooked for a long time, I don’t recommend it personally. Thanks for asking! This looks yummy and I very much want to try it, however, I am allergic to Gluten. I have GF soy sauce already on hand, but is there something I can sub for the flour or is it ok to just leave it out? I’m farrr from an expert on gluten sensitivity. SO, to be safe definitely leave the flour out. Can you use cornstarch instead? If so, go for that and it will have the same effect. Otherwise, the sauce will be very soupy and not like a gravy. If that doesn’t bother you, then go for it! There are some great cup for cup gluten-free flour options now, like Pamela’s that I use in all my recipes. Definitely need to use low sodium soy sauce. Even with that, I found the recipe too salty. Next time, I think I would decrease the soy. Otherwise it was tasty. Made this tonight and we LOVED it!!! Thank you for sharing!!! Made this tonight, didn’t ave low sodium soy sauce so I just added some extra beef broth and a little bit of water and it came out amazing!! This is the best homemade beef & broccoli recipe I have ever tried! I was wondering of you had the nutrition facts for it? Thanks! Thanks so much! That means a lot that you would take out the time to rate my recipe and leave a nice note! I am updating posts and this one I hadn’t got to yet. I did just update the nutrition info and you should be able to see it on the recipe card now. However, please keep in mind that I am not a nutritionist and any info can be wrong information. If you are looking for exact nutrition info I suggest contacting a nutritionist directly, thanks again! This was so delicious! I made a double batch so we would have leftovers. The sauce was so tasty! I will definitely make this again.